Farmers in the Doba area in the Kassena-Nankana Municipality in the Upper East Region say they have lost their investments to the perennial flooding caused by the Bagre Dam and want government to find a sustainable solution to the problem. Farmers at Doba have lost 60 acres out of over 150 acres of rice, beans, sorghum, millet and groundnuts cultivated this season. Deputy Agriculture Minister in charge of annual crops, Dr. Sabre Bambangi, has urged them to prepare for the dry season farming to cover their losses. A female farmer, Hellen Anabire, lost all her 3 acres of rice, groundnut and beans farm to the flood and wants support to revamp and to be able to take advantage of the dry season farming. Other farmers who had the opportunity to interact with the deputy agriculture minister asked for some assistance in the form of inputs and food to sustain them as they wait to do the dry season farming to cover their losses. The deputy Agriculture Minister and also Member of Parliament for Walewale, Dr. Sabre Bambangi, said the ministry was hopeful that there was going to be more yield this year, but with the effect of the floods across northern Ghana, the picture does not look so clear and called on the farmers not to give up; instead they should prepare themselves for dry season farming. 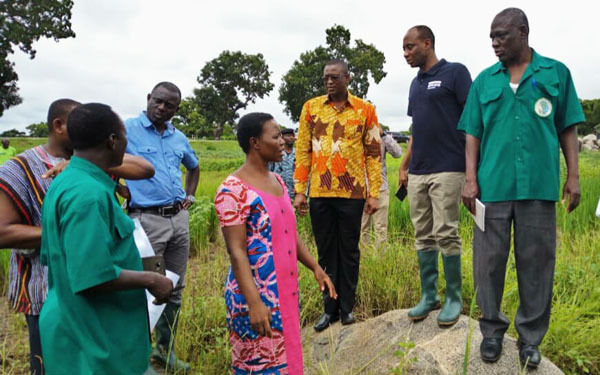 The deputy minister and his entourage inspected some affected farmlands in the Kassena-Nankana Municipality to get the true picture on the ground in order to advise the sector Minister of Agriculture, Dr. Owusu Afriyie Akoto. There was also a durbar with farmers working on the Tono Irrigation Fields to discuss ways to gain more from the use of the irrigation facility. The farmers said they had always been limited by inadequate tractor services and also combine harvesters, especially for farmers cultivating rice. They also called on the Ministry of Agriculture to get the banks to see the need to extend their loan facilities to farmers as large-scale farming is lucrative enough to pay back the loans given to farmers.